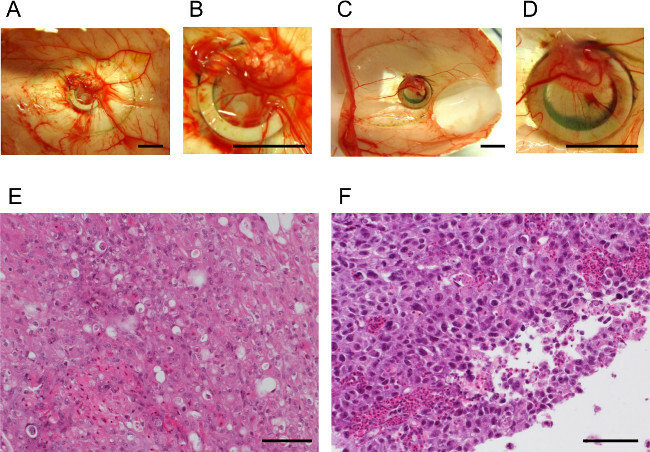 The chick chorioallantoic membrane (CAM) is immunodeficient and highly vascularized, making it a natural in vivo model of tumor growth and angiogenesis. In this protocol, we describe a reliable method of growing three-dimensional, vascularized hepatocellular carcinoma (HCC) tumors using the CAM assay. Li, M., Pathak, R. R., Lopez-Rivera, E., Friedman, S. L., Aguirre-Ghiso, J. A., Sikora, A. G. The In Ovo Chick Chorioallantoic Membrane (CAM) Assay as an Efficient Xenograft Model of Hepatocellular Carcinoma. J. Vis. Exp. (104), e52411, doi:10.3791/52411 (2015). The chick chorioallantoic membrane (CAM) begins to develop by day 7 after fertilization and matures by day 12. The CAM is naturally immunodeficient and highly vascularized, making it an ideal system for tumor implantation. Furthermore, the CAM contains extracellular matrix proteins such as fibronectin, laminin, collagen, integrin alpha(v)beta3, and MMP-2, making it an attractive model to study tumor invasion and metastasis. Scientists have long taken advantage of the physiology of the CAM by using it as a model of angiogenesis. More recently, the CAM assay has been modified to work as an in vivo xenograft model system for various cancers that bridges the gap between basic in vitro work and more complex animal cancer models. The CAM assay allows for the study of tumor growth, anti-tumor therapies, and pro-tumor molecular pathways in a biologically relevant system that is both cost- and time-effective. Here, we describe the development of CAM xenograft model of hepatocellular carcinoma (HCC) with embryonic survival rates of up to 93% and reliable tumor take leading to growth of three-dimensional, vascularized tumors. Hepatocellular carcinoma (HCC) is the 3rd leading cause of cancer mortality in the world1. Currently only 30% of HCC patients are eligible for potentially curative surgical treatments2, and systemic chemotherapy is not efficacious3. Therefore, there is a pressing unmet clinical need for novel HCC therapies, and the development of model systems suitable for efficient testing of new agents. The chick chorioallantoic membrane (CAM) assay provides a reproducible, cost-effective, and fast medium-throughput method of testing potential anti-tumor drugs in vivo. The CAM assay has been used extensively to study angiogenesis4. It has also been successfully developed into a tumor xenograft model of cancers, including glioblastoma5, pancreatic cancer6, melanoma7-9, and osteosarcoma10-11. Both in ovo12 and ex ovo13 techniques have been utilized in the literature, with details varying from protocol to protocol. One major challenge to the CAM xenograft model is the relatively high incidence of embryonic death after manipulation of the egg, with published chick embryo mortality rates ranging from 25 - 50 percent11-14. In this article, we describe the development of an in ovo xenograft model of HCC that reliably produces growth of three-dimensional, vascularized tumors that histologically resemble undifferentiated HCC. We have adapted a protocol first described by Ossowski et al.14 and have achieved chick embryonic survival rates of up to 93% with extremely high tumor engraftment. Obtain 8 day old specific pathogen-free embryonated eggs. Place eggs in rotating egg tray, stamped ends facing upwards, and place the rotating tray inside an egg incubator. Incubate eggs for 48 hr at 36 °C and 50% humidity. Gather eggs from incubator. Place eggs in egg rack, stamped side up, and bring to laminar flow hood. Turn off the room and hood lights. Hold the stamped end of egg lightly to the egg candler to expose the vasculature of the CAM as well as the air sac. NOTE: The egg candler is a light source used to visualize the developing embryo and associated air sac and vasculature. Place a pencil mark in between two major blood vessels. Turn on the lights and use a sterile push pin to make one hole at the tip of the egg above the air sac (stamped end) and one hole at the pencil mark. Do not push the push pin all the way through; a hole around 3 mm deep will usually suffice. Turn off the lights. Squeeze safety bulb, pressing the open end firmly against the hole above the air sac. Apply suction to pull air into the hole at the pencil mark, causing the CAM to drop away from the shell at the pencil mark. Check that the air sac has moved from the stamped end of the egg to the pencil-marked hole using the candler. If it has not, use the push pin to make both holes slightly deeper and then re-apply suction using the safety bulb. Turn on the lights. Holding the egg in one hand, turn on the dremel rotary tool with a 15/16 inch cut-off wheel attached and make two transverse cuts just deep enough to cut through the shell but not deep enough to cut all the way down to the depressed CAM. Make the cuts around 2 cm in length and 1 cm apart from each other. Make the cuts wide enough so that a silicone ring 1 cm in diameter can pass through but thinner than the width of standard scotch tape. Next, make 1 longitudinal cut between and at the ends of the two transverse cuts by lightly touching the cut-off wheel to the shell. Slide sterile forceps under the shell piece and parallel to the shell. Grab the shell piece with the forceps and remove the entire piece cleanly. Place scotch tape over the newly opened window, making sure to fold one end over on itself for ease of removal. Place eggs back in incubator in the egg tray (NOT in the rotating egg racks) until time of inoculation. Keep basement membrane protein mixture, such as matrigel, on ice (to prevent polymerization) and place in hood. Use 2 mM EDTA to detach cells (4 - 5 ml per T75 flask) and place flasks in tissue culture incubator for 5 min. Resuspend the detached cells in media and count using a hemocytometer and trypan blue. Use between 500,000 to 2,000,000 cells for grafting onto the CAM, depending on cell line. Optimize the proper number in preliminary experiments. Measure volume required for appropriate cell number and centrifuge at 500 x g for 5 min. Discard supernatant and then resuspend cell pellet in 40 µl of PBS++ and 20 µl of basement membrane mixture. NOTE: At this point, cells can be treated with drugs or other test agents as needed for experiments by resuspending into the cell/basement membrane mixture suspension. Alternatively, agents can be pipetted onto the cell/basement membrane mixture suspension after grafting. Retrieve egg rack with eggs from the incubator and place in the laminar flow hood. Peel tape off of the window, retrieve a 1 mm silicone ring from the cap of a cryogenic vial using sterilized forceps, and drop the ring through the window. Pipet the 60 µl cell solution of PBS++ and basement membrane mixture directly into the center of the silicone ring resting on the CAM. Re-tape the window and move egg rack back to incubator. At this point, use caution when moving the eggs as the ring and the cell suspension can easily become displaced. Allow tumors to grow for 5 to 7 days. Place under-pad in hood. Prepare 35 x 10 mm plates and paraformaldehyde containers as needed for histology. Put 1 ml PBS++ in each 35 x 10 mm plate. Place biohazard bag in hood. Take sterile dissection scissors and insert the pointed end into the egg at the hole near the stamped end. Cut around the entire egg longitudinally. NOTE: the CAM and the tumor with the ring should stick to the top half of the shell with the window. Using dissection scissors and forceps, dissect the tumor away from the CAM and place tumor in the 35 x 10 mm plate. Measure and weigh tumors. Fixed tumors in paraformaldehyde and then paraffin-embed them for use in histology and immunohistochemistry experiments. Use dissection scissors to mince the tumor in the 35 x 10 mm plate. Pour minced tumor into a 15 ml centrifuge tube and remove as much PBS++ as possible through pipetting. Add 2 ml of collagenase (1 mg/ml in PBS++), turn tube over several times, and incubate tube at 37 °C for at least 30 min (up to several hours). Add 5 ml media to each tube and resuspend thoroughly by pipetting up and down 20 - 40x. Thorough pipetting is critical for complete cell dissociation. Allow sediment to settle, and transfer the supernatant to a fresh tube. Centrifuge at 500 x g for 5 min. Remove supernatant, leaving behind dissociated cell pellet. NOTE: At this point, cell pellets can be used for various experiments (flow cytometry, lysis for use in Western blotting, RNA isolation, etc). Total tumor cell count can also be obtained using a hemocytometer and trypan blue staining. Note that smaller, oval-shaped cells are chicken cells from the CAM and should not be counted as tumor cells. There should be a minimal number of contaminating non-tumor (CAM) cells if the tumor is dissected away from the CAM carefully. Representative pictures of key steps in the protocol are shown here. Figure 1A demonstrates the use of the candler to visualize the developing embryo, the air sac, and the vasculature of the CAM. Figure 1B-1C show the process of dropping the CAM by making the two holes and then applying negative pressure using the safety bulb, and Figure 1D shows a successfully dropped CAM with a large air bubble under the pencil-marked hole. Figure 1E and Figure 1F demonstrate the usage of the dremel rotary tool to make the necessary cuts in the shell above the air bubble and the opened window in the shell with the exposed vascularized CAM within. Three-dimensional, vascularized tumors were successfully grown using the human HCC cell lines HUH7 (Figure 2A-2B) and PLC/PRF/5 (Figure 2C-2D). Tumors grown from HUH7 and PLC/PRF/5 cells histologically resemble undifferentiated HCC (Figure 2E-2F) and also resemble HUH7 and PLC/PRF/5 tumors grown in mouse xenograft models15,16. 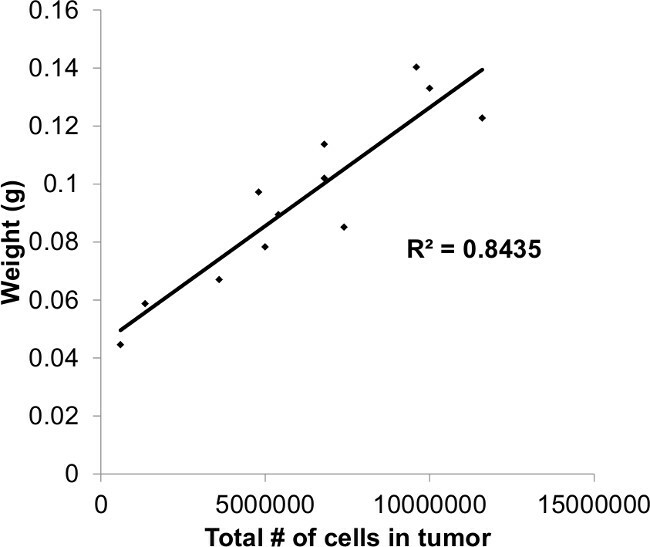 Furthermore, the use of tumor weight was validated as a measurement of tumor size by demonstrating that tumor weight was highly correlated with total tumor cell count obtained after complete dissociation of tumors using collagenase (Figure 3). Using this protocol, embryonic survival rates of up to 93% were achieved (Table 1). Table 1 shows aggregated data from three separate HCC experiments in the CAM xenograft model. Out of a total of 33 eggs that were successfully grafted with 500,000 tumor cells (HUH7 or PLC/PRF5), only 3 eggs resulted in chick embryo death, an overall survival rate of 90.9%. Furthermore, tumors were very reliably grown after 5 days, as 100% (30/30) of eggs with surviving embryos had successfully tumor formation. Figure 1. Dropping the CAM and Opening a Window in the Shell. 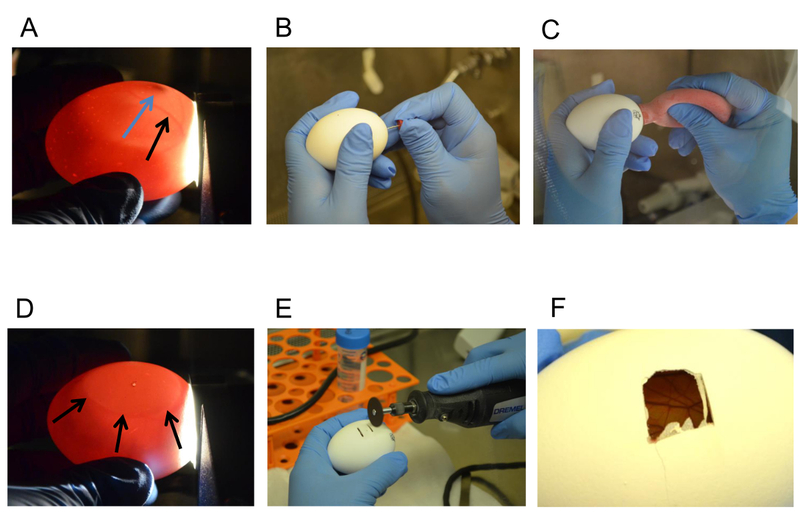 (A) Identification of Embryo (Blue Arrow) and Vasculature (Black Arrow) using the Candler, (B) Making a Hole in the Shell, (C) Applying Suction to the Hole at the Naturally-occurring Air Sac, (D) Visualizing the Air Bubble Showing Successful Dropping of the CAM away from the Shell, (E – F) Opening a Window in the Shell using the Dremel Rotary Tool. Please click here to view a larger version of this figure. Figure 2. The CAM Supports Growth of Three-dimensional, Vascularized Tumors that Histologically Resemble Undifferentiated HCC. (A–B) Tumor growth after 5 days in the CAM model, HUH7 cells (500,000 cells seeded) (scale bars = 1 cm), (C–D) Tumor growth after 5 days in the CAM model, PLC/PRF/5 cells (500,000 cells seeded) (scale bars = 1 cm), (E–F) Histology of HUH7 and PLC/PRF/5 tumors, respectively (scale bars = 100 µm) Please click here to view a larger version of this figure. Figure 3. Plot of Tumor Weight vs. Cell Count. Tumor weight is highly correlated with total tumor cell count after collagenase dissociation. Table 1. Embryonic Survival Rates and Rates of Tumor Take in the CAM Model using Two Human HCC Cell Lines. Several key steps in this protocol most likely account for the improved embryonic survival as well as increased reliability of tumor growth. 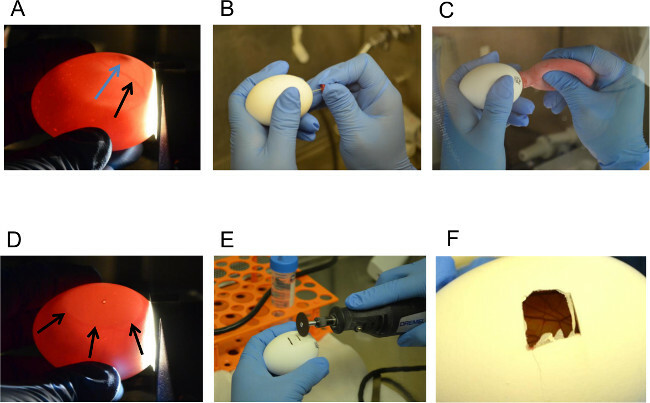 Dropping the CAM away from the shell by applying suction to the air sac is less invasive than other existing methods (using a needle to remove albumin from the egg, blunt dissection, etc.). Using a sterile push pin to create the two small holes required for this method is the most challenging part of the protocol. Using too much force can result in damage to the CAM and its vasculature through over-penetration with the push pin or can even result in cracking or destroying the egg. Hands-on practice using a push pin to make small holes in non-fertilized, grocery-bought eggs can minimize mistakes made during the first attempt at dropping the CAM. Furthermore, the use of ethanol or other disinfectant solutions to clean the shell decreases embryonic viability, and should be avoided. Finally, using the sterile silicone ring to “corral” the tumor cells in one specific location after seeding assists in tumor growth and contributes to the high rate of tumor take seen in our protocol. Some optimization of critical steps in the protocol will most likely be required when working with different cell lines and/or drugs. The suggested number of cells for seeding is between 0.5 and 2 million, but some cell lines may require higher or lower seeding densities to form a nice, three-dimensional tumor. Grafting too few cells can result in poor tumor formation, while grafting too many cells can result in tumor overgrowth in which the tumor occupies the entire silicone ring, becomes flatter and less three-dimensional than is ideal, and can escape the boundary of the ring. We recommend setting up a preliminary experiment to determine the optimum cell seeding density for any particular cell line. Furthermore, some adjustment to standard in vitro drug concentrations can be required. We calculate drug concentrations with reference to the total volume that is seeded onto the CAM (60 µl), but sometimes “higher” drug concentrations than those used in parallel experiments in vitro are required in order to see effects on tumor growth, presumably due to absorption through the CAM and dispersal of drug to the rest of the egg. After successful optimization of the protocol for specific cell lines and drugs, the CAM xenograft model can be used to investigate a wide variety of tumor properties and cellular mechanisms. Tumor growth can be assessed through weight and size measurements as well as total tumor cell counts. Tumors can be fixed and subjected to immunohistochemistry to stain for tumor markers or specific proteins of interest. Angiogenesis can be assessed by staining for SNA1, which specifically stains chick endothelial cells17. Tumor cells can be lysed for interrogation of molecular pathways. As an intermediate step in bridging pure in vitro work with more complex models of cancer such as orthotopic animal models, the CAM xenograft model is a cost-effective way of quickly obtaining data in a setting that is more biologically relevant than cells grown in culture. A.S. receives funding from the Advaxis Pharmaceutical company to support an investigator-initiated clinical trial. A.S. was partially supported by grants from the National Institutes of Health (NIH) National Institute of Dental and Craniofacial Research (5R03DE021741-02) and the National Cancer Institute (1K08CA154963-01A1). The Howard Hughes Medical Institute provided funding for M.L. through the HHMI Medical Research Fellows Program. Sangiovanni, A., et al. Increased survival of cirrhotic patients with a hepatocellular carcinoma detected during surveillance. Gastroenterology. 126, (4), 1005-1014 (2004). Lopez, P. M., Villanueva, A., Llovet, J. M. Systematic review: evidence-based management of hepatocellular carcinoma--an updated analysis of randomized controlled trials. Aliment Pharmacol Ther. 23, (11), 1535-1547 (2006). Llovet, J. M., Burroughs, A., Bruix, J. Hepatocellular carcinoma. Lancet. 362, (9399), 1907-1917 (2003). Folkman, J. What is the evidence that tumors are angiogenesis dependent. J Natl Cancer Inst. 82, 4-6 (1990). Hagedorn, M., et al. 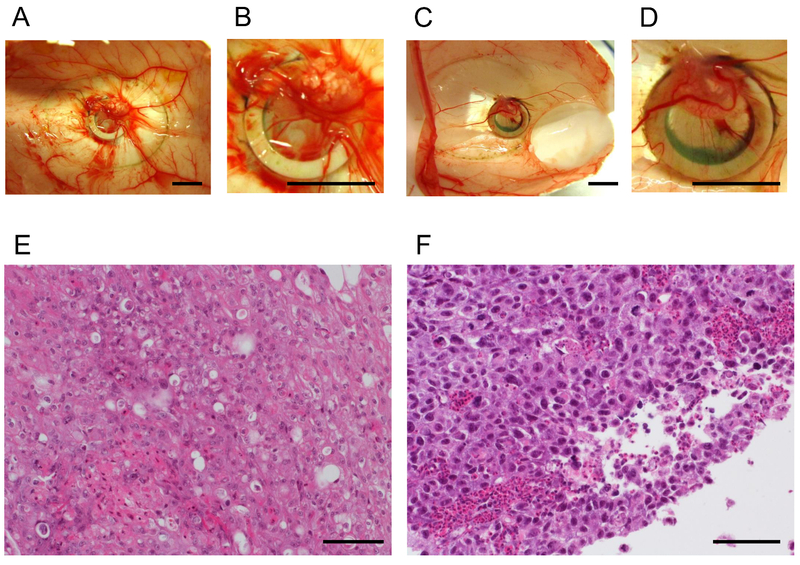 Accessing key steps of human tumor progression in vivo by using an avian embryo model. Proc Natl Acad Sci U S A. 102, (5), 1643-1648 (2005). Dumartin, L., et al. Netrin-1 mediates early events in pancreatic adenocarcinoma progression, acting on tumor and endothelial cells. Gastroenterology. 138, (4), 1595-1606 (2010). Aguirre-Ghiso, J. A., Estrada, Y., Liu, D., Ossowski, L. ERK(MAPK) activity as a determinant of tumor growth and dormancy; regulation by p38(SAPK). Cancer Res. 63, (7), 1684-1695 (2003). Baroni, T. E., et al. Ribonomic and short hairpin RNA gene silencing methods to explore functional gene programs associated with tumor growth arrest. Methods Mol Biol. 383, 227-244 (2007). Lopez-Rivera, E., et al. Inducible nitric oxide synthase drives mTOR pathway activation and proliferation of human melanoma by reversible nitrosylation of TSC2. Cancer Res. 74, (4), 1067-1078 (2014). Balke, M., et al. A short-term in vivo model for giant cell tumor of bone. BMC Cancer. 11, 241 (2011). Balke, M., et al. Morphologic characterization of osteosarcoma growth on the chick chorioallantoic membrane. BMC Res Notes. 3, 58 (2010). Sys, G. M., et al. The in ovo CAM-assay as a xenograft model for sarcoma. J Vis Exp. (77), e50522 (2013). Dohle, D. S., et al. Chick ex ovo culture and ex ovo CAM assay: how it really works. J Vis Exp. (33), (2009). Ossowski, L., Reich, E. Experimental model for quantitative study of metastasis. Cancer Res. 40, (7), 2300-2309 (1980). Ghanekar, A., Ahmed, S., Chen, K., Adeyi, O. Endothelial cells do not arise from tumor-initiating cells in human hepatocellular carcinoma. BMC Cancer. 13, 485 (2013). Ho, J. W., et al. Effects of a novel immunomodulating agent, FTY720, on tumor growth and angiogenesis in hepatocellular carcinoma. Mol Cancer Ther. 4, (9), 1430-1438 (2005). Hagedorn, M., et al. VEGF coordinates interaction of pericytes and endothelial cells during vasculogenesis and experimental angiogenesis. Dev Dyn. 230, (1), 23-33 (2004).